Dedicated to keeping your pool performing at its best. A complete line of quality sanitizers, oxidizers, balancers, and algaecides, all color coded in consumer-friendly packaging for easier product selection. 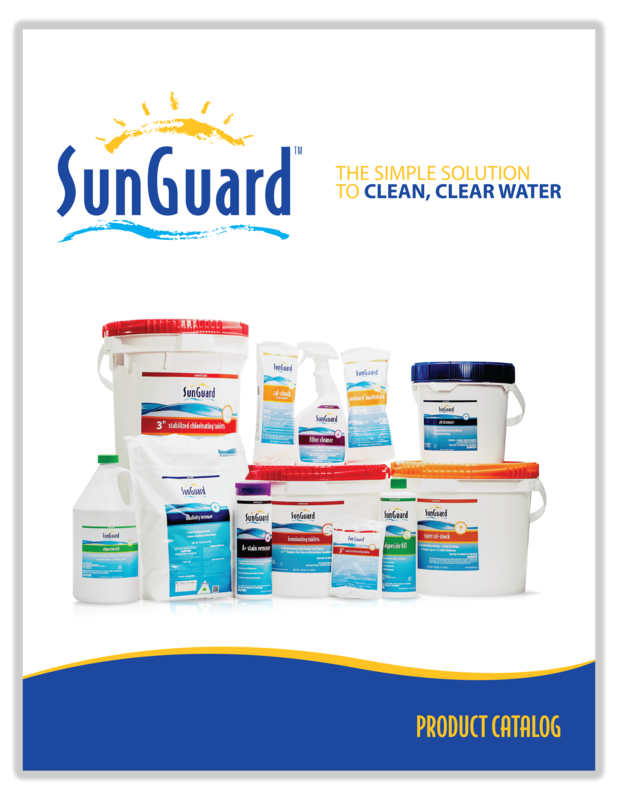 In addition, SunGuard also offers a line of ancillary products that provide solutions for a variety of maintenance and water conditioning problems, all under the same brand. A complimentary line of sanitizers, balancers, and accessories to keep spas looking great, inside and out. Our Dealers say that our professional water analysis lab & software provide the most reliable results on the market. When you sign and send in the dealer agreement for SunGuard, you become an Authorized SunGuard Dealer and receive all the benefits that come with this program. The pack includes SunGuard water sample bottles, pool care guides, banners, window decals and more. These customized direct mail pieces are quick and easy to create, and allow you to personalize them with your store information, pricing and a custom coupon to attract new consumers to your business. Get the most out of your advertising dollar. Reinforce the SunGuard brand and increase consumer confidence. One-stop shopping, next day delivery with no cut-off time, no freight charge, and no need to be concerned with freight claim issues. Order anytime of the day or night using our DealerZone online ordering system. Hachik maintains your inventory and helps manage your cash flow. Technical support is locally available in your area to assist you with any technical issues that may arise. View our SunGuard Product Catalog! Yes! I want to be a SunGuard Dealer. Complete the following information and a Hachik representative will contact you about carrying SunGuard Pool & Spa products.